I recently had the opportunity to travel to PEI for a well needed family vacation. We had previously travelled as far a Gaspe and intended to continue our exploration of maritime Canada by visiting PEI. Of course, the most authentic maritime experience I could think of was to hit the ocean for some deep sea fishing. Tales of the fabled COD fisheries of old filled my head as a youth and I was eager to investigate the state of the fishery for myself. 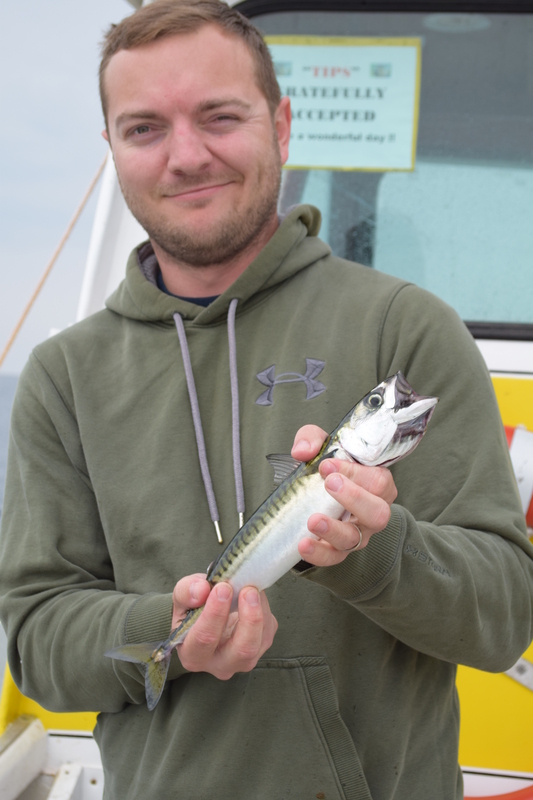 I was also interested in investigating the variety of fish available for an angler as I was recently surprised to learn there are over 50 species of fish have or are being commercially harvested (at one point or another) in the northwestern Atlantic. 50 +! Granted most of these are deep water varieties, but I didn’t let this stop my hopes for landing some weird critters. 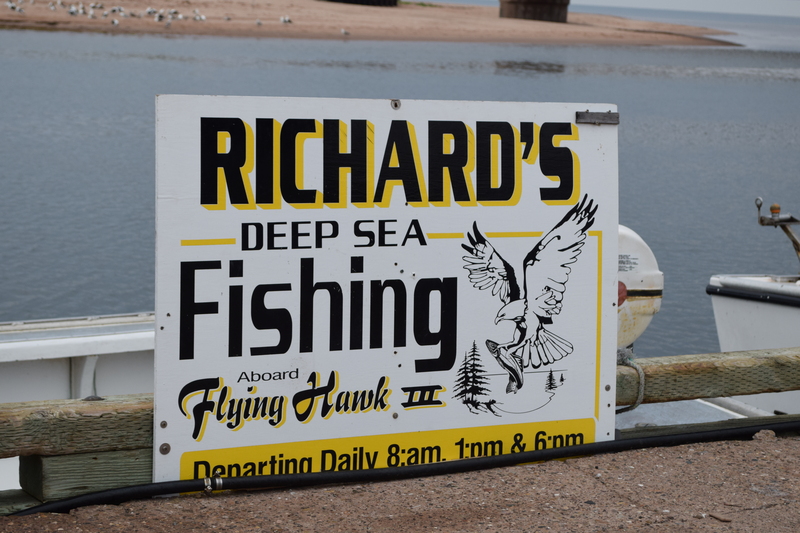 So when we arrived at our cottage in PEI I eagerly head down to the local wharf to see what options there were for deep sea angling. After careful consideration I opted to head out with one of the larger tours that ran out of Covehead Harbour, located near Stanhope, along the north shore of PEI. The boat was clean, well outfitted and the captains seemed very knowledgeable. According to the captain, the fishing had been slow across the board for the last week, although he was hopeful we would find fish. As we pulled out of the harbour we discussed the details of fishing the atlantic ranging from locating fish to what we could expect to catch. Although young, our Captain seemed extremely knowledgeable and it was obvious he had been raised with one foot in the ocean. He regaled me with stores of giant halibut and Hake caught while fishing cod, and detailed the perils of Lobster fishing which he took part in every year. All the while he kept one eye on the fish finder mounted on the dash of the helm. Suddenly, mid scentence, he announced we had stumbled upon a mackerel grouping in approximately 40 FOW and that we should get our lines in the water. Finally we had arrived and the fun was about to begin. The captain gave a brief tutorial as he dropped a line in the water. The captain released the catch on the large saltwater reel and the weighted mackerel rig dropped into the briny depths. 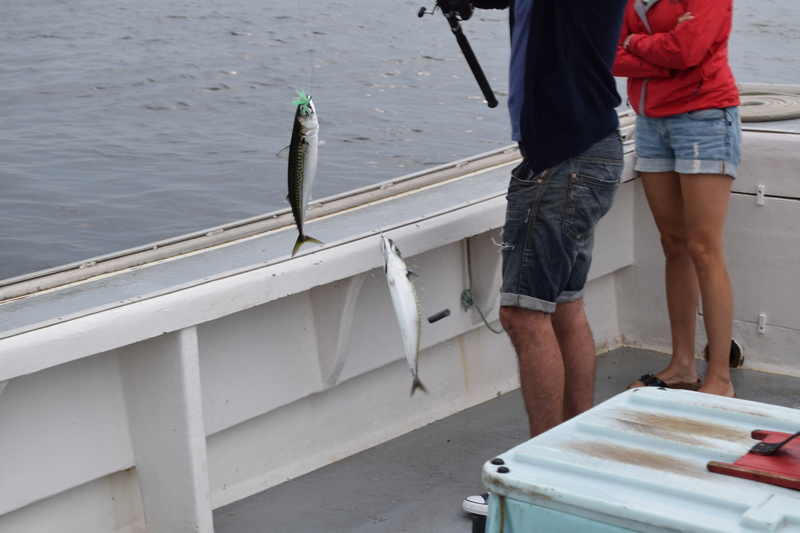 In seconds the captain deftly hauled a brace of mackerel aboard the boat and explained the mackerel bite anything that moves and that we should drop and jig vigorously to maximize our catch. Fish were caught immediately by all aboard. 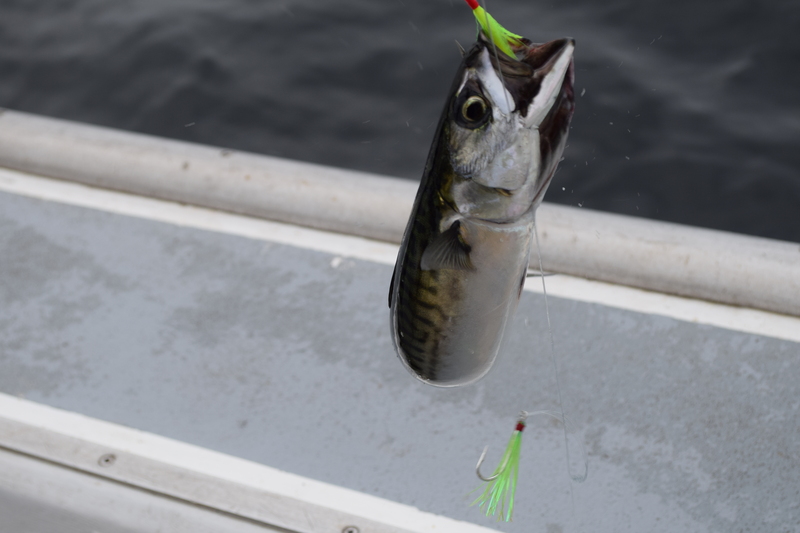 Mackeral put up an impressive fight darting in all directions as they are reeled in. This is compounded when multiple mackerel are hooked; which is often the case. Even once aboard the boat, these fish refuse to give up and will flop about the deck until stored on ice. 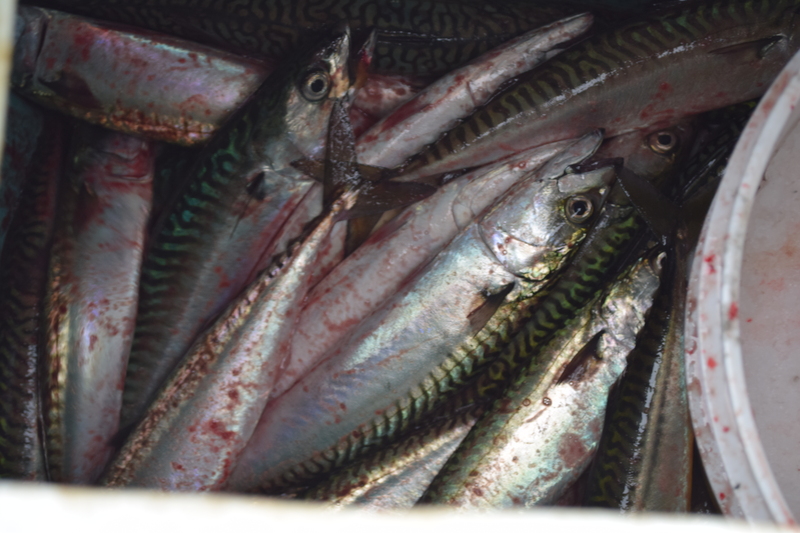 Pretty soon we had a full icebox of mackerel and a boat load of very happy fisherman. 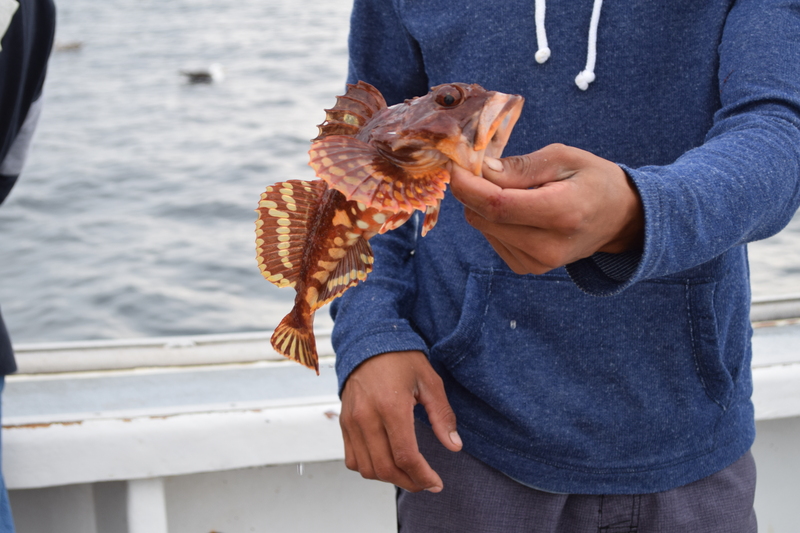 We even caught some sculpin, AKA “mother in laws” as they call them out east. Lots of fun all around, but now it was time to track down some cod. We pulled up our lines and headed out to 90 FOW. The rigs were baited by the first mate with bits of mackeral and once again our captain gave a brief tutorial on how to catch cod. He instructed us to drag our baits just above bottom and wait for bites. 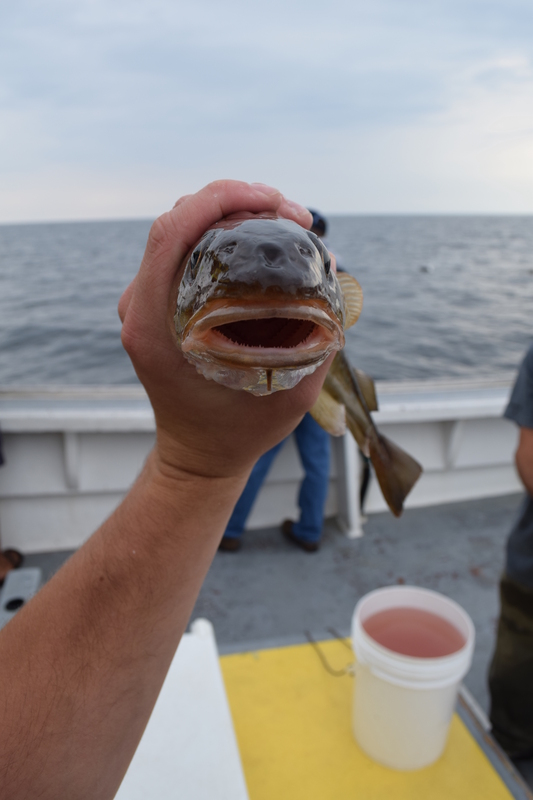 Sure enough, the cod started to bite and we got our first glimpse of the fish that once filled the nets and bellies of many an east coast fisherman. From a fishermans standpoint, the cod is not much of a game fish. Once hooked they make very few runs, all of which are unimpressive. Most times they just come right along into the boat. Regarless of this limp fighting style, the fish has a hefty feel giving the angler the impression that dinner is in your hands when held. With their thick fillets and meaty build, It is easy to see why these fish were once fished so heavily and how they were ale to feed a growing world. Our boat managed to catch our limit of keepers (2 per person) and we headed back home to enjoy our catch. 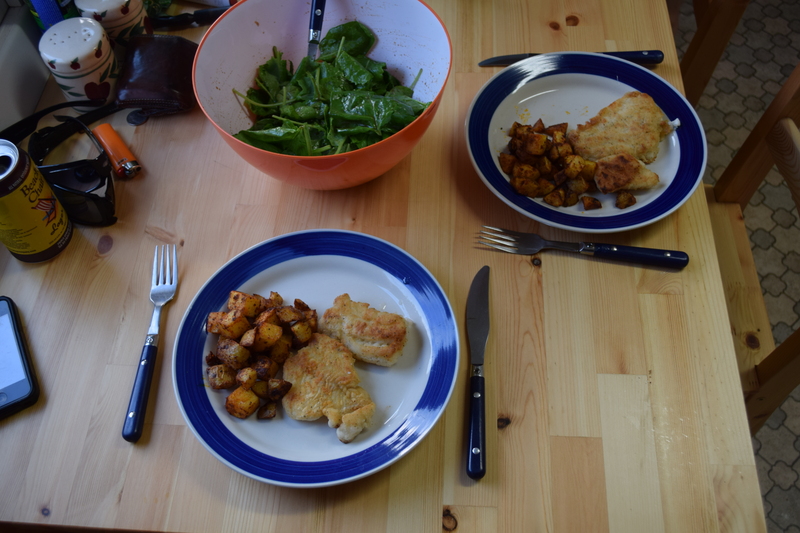 I can say without a doubt, our meal of freshly caught cod along with new PEI potatoes was the best of the trip. You haven’t had cod until you’ve caught your own and cooked it right away. 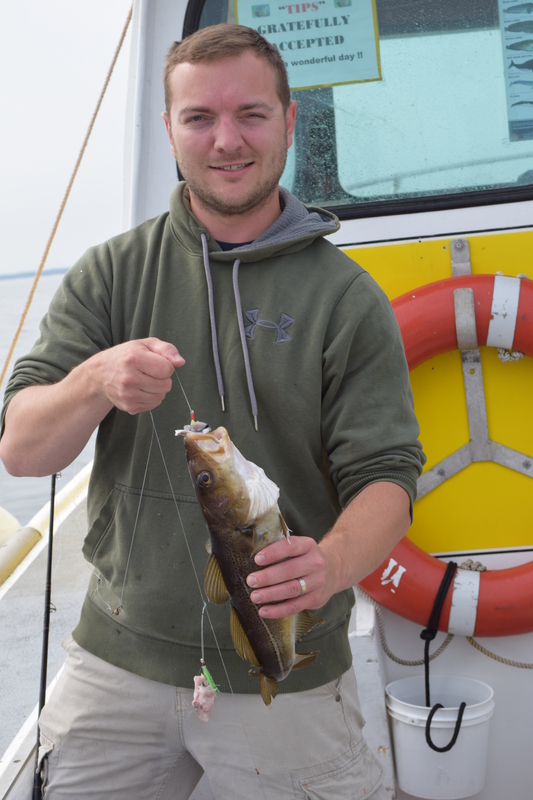 This entry was posted in Fishing and tagged Cod fishing in PEI, Deep sea fishing in PEI, Fishing eastern Canada, fishing the maritimes, fishing vacation, Get Outside, makeral fishing, PEI, Richards Deep sea fishng, the wilds of ontario, things to do in canada, wild ontario. Bookmark the permalink. I work the Friday night Fish Fry every single Friday. And every single Friday, I’d much rather be fishing. Our cod is good, but I doubt it’s as good as fresh caught. I’m jealous. Such a delicious fish! I bet its good where ever you eat it. 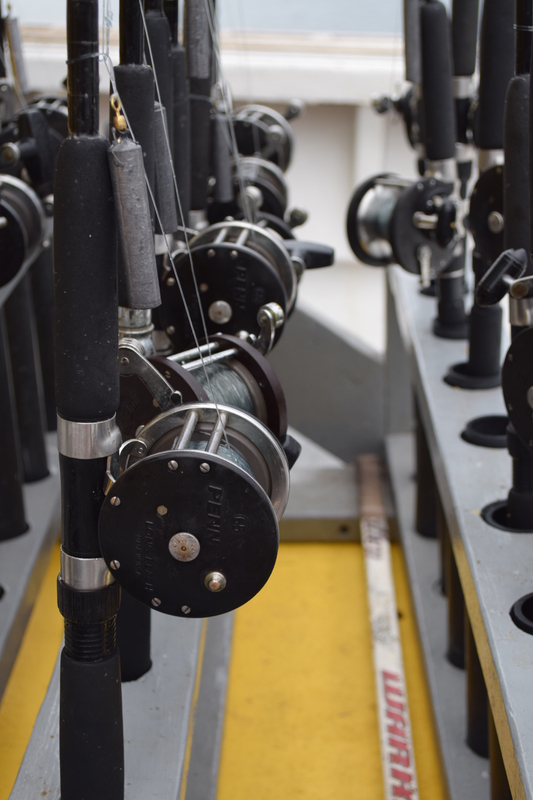 Thank you Albert for the great article on your Deep Sea Fishing trip with us. Someone sent it to us this following week. We would love the opportunity to thank you in person on your next trip to the island. No problem. Thanka for the great fishing experience! I will definitely stop in next time i am there.